2013 is shaping up to be the year of the drone. Consumers of most major news media outfits are likely to read about uses of drones, domestic and foreign, on a regular, if not daily, basis. Senator Rand Paul launched an old-fashioned talking filibuster of the Obama Administration’s nominee for CIA Director, John Brennan. Paul’s foray into the high art of political theater was designed to force the Obama Administration to answer a fundamental constitutional question – is the president authorized to “use … a weaponized drone to kill an American [citizen] not engaged in combat on American soil?” Paul’s 13 hour stand came in the wake of last month’s release of a secret White House white paper, arguing that an “informed, high-level” official of the U.S. government may legally order the extrajudicial execution of an American citizen abroad, if he or she is believed to be an imminent threat associated with al-Qaida. As we continue to debate the use of weaponized drones, the next logical question is: how far does the president’s commander-in-chief authority extend over American citizens at home? Any exploration of presidential powers, particularly those of the commander-in-chief, must begin with a discussion of General—and later President—George Washington. When the Constitution described the new presidency’s military power with the amazingly few words, “The President shall be Commander in Chief of the Army and Navy of the United States,” the Founders were not being cagey. On the contrary, they needed no further description because it was so evident to the patriots what they meant: the same powers that General Washington had exercised in the Revolutionary War to protect them. Interestingly, there are a number of early precedents that speak to Senator Rand Paul’s concern over the domestic use of military force against American citizens. During the perilous years of the Revolution, there existed a group of Americans who actively fought against and undermined the American cause in the grand battle for Independence. In fact, approximately 15 to 20 percent of the existing population supported the British. Likening these Loyalists to “Spiders, Toads, [and] Snakes,” John Adams colorfully described them as “the most despicable Animal in Creation.” But at the same time, trampling the rights of even such a “despicable Animal” violated the Americans’ commitment to republican principles. Some of these Loyalists actively took up arms against their nation. These men were shot on the battlefield, whether that be in Canada or New Jersey—Washington had no qualms about protecting his people from imminent attack. If you charged at Washington with a musket, he would not hesitate to put you down. However, other Loyalists were merely suspected of treasonous acts, speaking out against the revolution, and breaking other laws. This distinction between the charging violent threat vs. the mere lawbreaker was crucial. Washington gunned down the former and protected the rights of the latter. Take the saga involving the colonial mayor of New York City, David Mathews. Mathews, a known Loyalist who had been appointed to his post by the royal governor, became embroiled in a plot to assassinate Washington. Like any good story, this tale of intrigue began with a mysterious woman. While accounts differ, one states that on a warm June afternoon in 1776, this woman insisted on speaking privately with Washington. Taking her aside, the general learned of an “infernal plot”: the woman claimed to have witnessed one of Washington’s bodyguards poisoning his peas for that evening’s dinner! The unflappable Washington was said to have reacted calmly and decisively: he threw the peas into the yard, where some unlucky hungry chickens swiftly met their demise. Convinced that the woman’s revelation was true, he moved to eradicate the threat. As the Americans dug into the unraveling plot, all signs pointed to Mathews’ complicity. Carrying lanterns and “proper instruments to break open houses,” Washington and a few trusted men set out to the mayor’s house. When they arrived, many expected their general to shoot Mathews on the spot. But he did not. Washington, ever conscientious of proper procedure, merely arrested and threw him in jail. As commander in chief, Washington did not see himself as having the right to punish private citizens. He left the fates of the civilian conspirators largely to the discretion of the civil authorities – even if those authorities were not particularly capable. As the wily Mathews awaited trial, he bribed his guards with 150 pounds sterling, and escaped to British-occupied territory. While technology has and will continue to change, our values and our precedents do not have to. Washington had riflemen and artillery with which he might mount a targeted surprise attack from a distance, like we do now with drones. But Washington never ordered his sharpshooters to pick off Mathews nor did he use his vast network of spies to take him out. Washington refused to adopt a policy of summarily executing Americans. Based on his understanding of the laws of war and his role as the American commander in chief, that would have been a violation of their rights as citizens. Attorney General Eric Holder responded to Senator Paul last week that the President lacks authority to use drones to kill an American on U.S. soil who is not engaged in combat. But he still left the door open by neglecting to define “combat.” Holder has argued, “the president could conceivably have no choice but to authorize the military to use such force if necessary to protect the homeland in the circumstances like a catastrophic attack like the ones suffered on December 7, 1941, and September 11, 2001.” He would be much more squarely in line with Washington’s precedents if he were to definitively state that the President can potentially use a drone to defend the nation from a crazed American driving a plane into the White House, for example, but also assure us that the Administration cannot use drones against Americans accused of misdeeds. Despite great evidence that Mathews was a central part of a conspiracy to kill him, Washington left the determination of guilt to the courts and only struck those men running at him with guns. While it is most certainly within the President’s power to muscularly defend the nation from all foreign threats, he must make sure we are protecting America’s founding constitutional principles at the same time. Although targeting foreign terrorists is something our Founders would applaud, killing U.S. citizens suspected of crimes is setting us on a slippery slope—what are the limits on our growing government’s power over Americans? 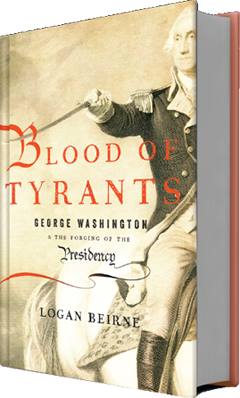 *Logan Beirne is an Olin Scholar at Yale Law School and the author of the forthcoming book Blood of Tyrants (Encounter Books, April 2013). This is cross posted by ConSource and The Federalist Papers. 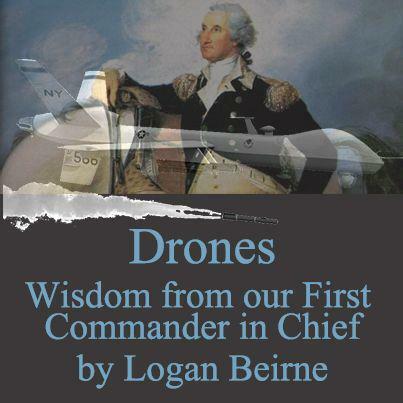 This entry was posted in Postings on March 21, 2013 by loganbeirne.